Nokia E61 is a Smartphone running on Symbian 9.1 OS and features slim profile, full QWERTY keyboard, S60 smartphone platform, Wi-Fi, EDGE high-speed data, Bluetooth, and a miniSD card slot. In addition, Nokia E61 supports quad-band GSM, has speakerphone feature, full HTML web browser, speaker-independent voice dialing, and music player. Nokia E61 is also a high-end email device just like BlackBerry. 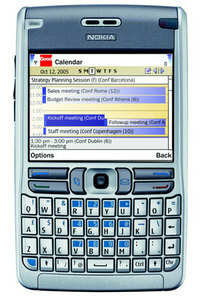 OSNews reviewed Nokia E61 mobile phone and concluded that “overall, this is actually a great device. Remember, this is the first of its kind coming out from Nokia. In my opinion, this device is much more stylish than either the Treo or the Blackberry, and its voice features works very well. In my opinion, this device can even replace PDAs on the enterprise, as more and more third party applications are ported every day to this updated S60 platform. I like this phone very much, despite of some of its bugs due to the young age of the firmware.” OSNews rated Noka E61 with rating of 7.5 out of 10. Check out more reviews of Nokia E61.